Our emotional and mental health and wellbeing are vital to living a balanced life. When our emotions are healthy and we’re in a positive mental state, it’s much easier to cope with the daily demands of life. Our mental state literally dictates the way we perceive the world around us. Maintaining positive mental health is imperative for self-confidence, success in business, sustaining good relationships with others, and living to our fullest potential. Just as we take care of our physical health by exercising and eating nourishing foods, we must take care of our emotional and mental health if we want to live an enjoyable life. What Is Emotional and Mental Health? Our emotional and mental health affects our social and psychological well-being. Not only does it affect how we feel and act, but it also dictates our stress levels, sleep patterns, the choices we make, and how we get along with others. Our emotional and mental health are central to feeling good and living a balanced life. Even the healthiest people sometimes face emotional health problems. It’s easy to succumb to the stress of our modern world, and this is often when mental health issues tend to arise. When we experience extreme stress, our nervous system often suffers, which can lead to depression, anxiety, and a number of other health problems and emotional issues. Experiencing mental health problems is more common than you might think. Anyone can experience emotional and mental health problems at any point in their life. And many of them will. Approximately 1 in 5 American adults (that’s 43.8 million people) experiences some kind of mental illness in a given year. Emotional and mental health problems are common, perhaps so much so that we don’t always give them the attention they deserve. Many people don’t take mental health issues seriously and tend to disregard the way they feel or ignore the fact that something is wrong. If our mental and emotional health is so important to our well-being, why do so many of us ignore it? We overlook our emotional and mental health issues because many of us believe this is what we’re supposed to do. We think the way we feel is somehow our fault. We’d rather keep our negative feelings to ourselves than talk about them with others. We’ve been taught not to talk about our problems. We’re all going to experience some kind of emotional crisis or mental health issue in our lifetime. It’s essential we address these problems when they arise rather than ignore them. The quality of our life depends on the way we think and the way we feel. People who are healthy mentally and emotionally are more apt to work through the problems that are an inevitable part of life. When someone is in good emotional and mental health, it’s much easier to handle stress and difficult times. It’s important that we’re able to face our problems when they arise. When we experience poor mental health, it makes it much more difficult to face adversity. 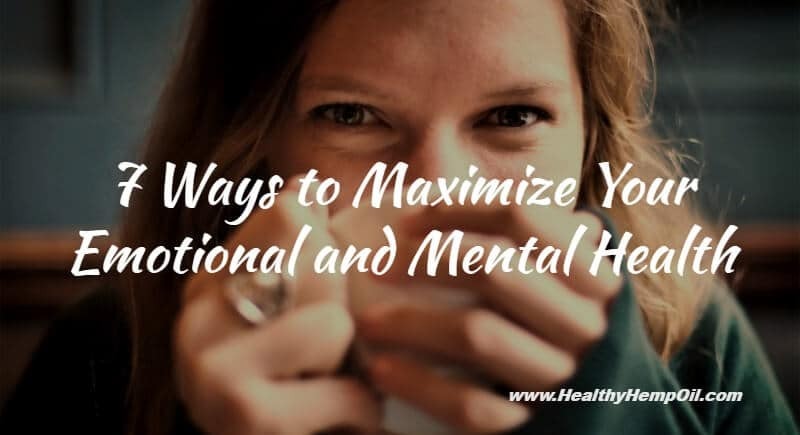 Addressing your mental health is one of the most important things you can do to relieve stress and anxiety and maintain a better quality of life. We can take steps to address, improve, and maintain our mental health. By doing so, we ensure that we’re living to our fullest potential and handling life’s setbacks with ease. Being conscious to improve our mental and emotional well-being is the first step to living a healthy and balanced life. Stress is the primary reason people experience emotional and mental health issues. With our modern lifestyles, it’s become difficult not be feel stressed out; most of us simply accept stress as a natural part of life. Managing stress, however, is vital to improving the way you feel. Engaging in regular relaxation techniques and getting quality sleep are pertinent for managing stress levels. Deep breathing, meditation, and quiet contemplation are all excellent tips for managing stress and anxiety; these tips will hopefully help immensely with your emotional and mental health. Dealing with negative emotions when they arise instead of letting them fester is also good for dealing with stress. Having a support network of friends and family also helps to keep our mental state in check. When we connect with others, it’s much easier to cope with life’s pressures. We’re not meant to live isolated from others, and doing so will only increase stress levels. Talking to a good friend or someone who listens to what you have to say (without judgment) can help you cope with the negative feelings you might be having. Having the ability to talk about your emotions and the way you feel will greatly improve your mental state. Getting regular exercise is vital to your emotional and mental health. Our bodies and minds are intricately connected, and when we take the time to get our bodies moving by engaging in regular exercise, it can do wonders for our mental state. Exercise has been shown to reduce stress, invoke feelings of well-being, improve sleep, and relieve emotional issues such as depression and anxiety. Making sure to take good care of yourself is also vital for positive emotional and mental health. How we treat ourselves is fundamental for feeling good, and ensuring we make self-care a priority will drastically improve our emotions and mental wellbeing. Be sure to get enough sleep, do things you enjoy, surround yourself with people who make you happy, and engage in activities that stimulate your mind. Taking care of you is one of the best things you can do to improve mental health and stay emotionally balanced. What you put in your body has a dramatic effect on how you feel mentally and emotionally. If you’re eating unhealthily, you’re going to feel unhealthy, both physically and mentally. Processed foods, sugar, alcohol, and large amounts of caffeine can drastically affect your emotional state. Doing your best to avoid these foods and replacing them with healthy, nourishing foods will increase your mood and keep your emotional and mental health balanced. Increase your intake of fresh fruits and vegetables, lean proteins, leafy greens, and healthy fats, and you’ll dramatically increase emotional and mental health. Feeling better mentally and emotionally is absolutely possible when you know the right steps to take. Addressing your emotional and mental health is the first step toward living a life that is rich in meaning and filled with purpose. Making positive mental health a priority will significantly change the way you experience the world around you. If you’ve found other ways to improve your emotional and mental health we’d love to hear about it in the comments below!